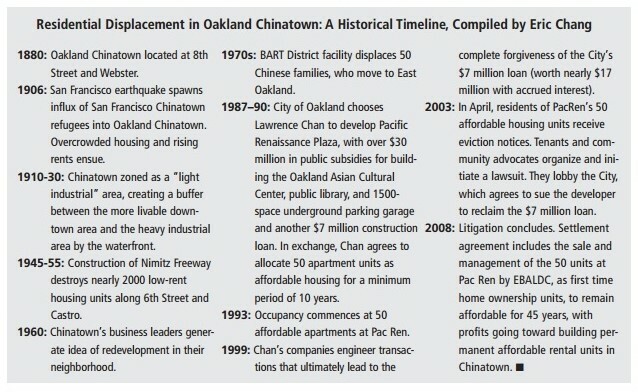 In April 2003, residents of 50 units of affordable housing received eviction notices in Oakland’s Chinatown Pacific Renaissance Plaza, a product of urban redevelopment spanning two decades. These residents came together with community activists to fight the evictions, to allow residents to remain in their units, and to preserve the community's right to affordable housing. This became a five-year battle, and in 2015, construction of 50 replacement affordable housing units—a stipulation won in the struggle—have still not been built. Agreements for the development were signed in 1987 and 1990. The City chose developer Lawrence Chan for the project. Chan was “a multi-millionaire giant” who owned the Oakland Marriott Hotel and the Oakland Courtyard by Marriott Hotel and ran the Oakland Convention Center. He also owned the Parc 55 hotel in San Francisco, the Park Lane Hotel in Hong Kong, and many other properties worldwide. His family’s companies owned properties in Hong Kong and other parts of Asia, Europe and North America. (7) City staffers preferred Chan over the other developers because they believed he had the stronger finances to guarantee the project’s completion. Under the final Pacific Renaissance development agreement, the City loaned Chan $7 million to assist with construction in addition to over $30 million in public subsidies for building the Oakland Asian Cultural Center, a public library, and a 1500-space underground parking garage. (8) The city redevelopment agency aggregated the land on which the Renaissance Plaza now stands and sold it to Chan with the understanding that when the project made money the city would get a share of the profit as part of the return. The city of Oakland also allowed Chan and his company to pay $8 million less than value of the land that the development was built on. In exchange, Chan was to build fifty affordable housing units, and the units would be renegotiated at the end of 10 years. Although the developer originally promised to build the various elements at no cost to the City when he was seeking development rights, the city of Oakland ended up investing an additional $10 million into building the garage, the library and the cultural center. Chinatown’s Pacific Renaissance Plaza finally opened in 1993. (9) It was considered a real victory for Chinatown. It signaled change from a Chinese-centric neighborhood to a multicultural and pan-Asian identity. Hundreds applied for the units. Getting in was like hitting the jackpot, allowing low-income families to have a place in what was considered “a five star hotel.”(10) Applicants were screened for eligibility based on income to live in its mostly one- and two-bedroom units. The Stop Chinatown Evictions Coalition (SCEC) formed quickly. 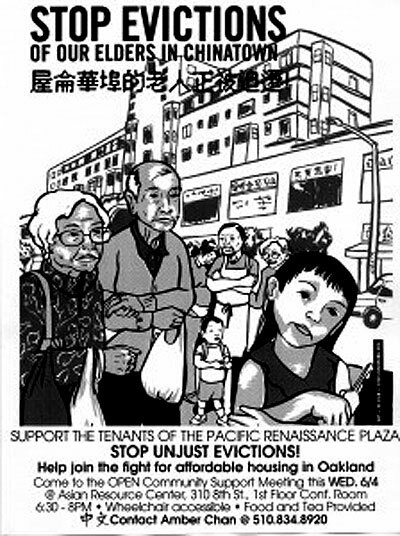 Community members and members of different social justice organizations, Chinese community groups, and housing activists decided to join together with the residents in the Pacific Renaissance Campaign to demand that the tenants be allowed to stay and that the units be preserved as permanently affordable housing. Along with Causa Justa/Just Cause Oakland and the EBCLC, coalition members from prominent organizations included Asian Pacific Environmental Network (APEN), the Chin Jurn Wor Ping Evictions Committee (CJWP), United Seniors of Oakland and Alameda County, Oakland Tenants Union, and Alan Yee of Siegel & Yee. The attempted evictions in the Pacific Renaissance Plaza took place in a climate of increased social justice activism in the Bay Area, particularly activism involving environmental justice and youth organizing, and at a time of increasingly difficult economic, political, and social conditions for working class, poor, and immigrant families. 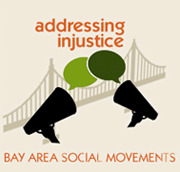 (17) The Coalition built upon networks formed among organizations and individuals during previous work on housing issues in Oakland and anti-war mobilizations. The coalition members knew that the opportunity to live at Pacific Renaissance meant more than just affordable housing, it meant also access to doctors and other service providers speaking their languages, proximity to friends and family, and accessibility to community churches, temples, and schools. (18) Many tenants in the affordable units were elderly and disabled; a few were young couples with children. Most were new immigrants and non-English speakers of Mandarin, Cantonese, and Vietnamese. The Pacific Renaissance Plaza was a significant aspect of the lives of many, and the coalition was willing to fight for it. The initial goals of the SCEC’s campaign were to stop the evictions, to secure the right to stay for the few families who had not moved out after the eviction notice, and work for the right of return for those who had. The first phase of the campaign against the evictions revolved around a highly active and publicly visible effort, and lasted for six months until September 2003. Community members asked people in Chinatown to sign petitions to the government to stop the eviction and held community meetings with local government representatives in the effort to hold the developer and the city of Oakland accountable for the situation that the tenants were facing. The activists were able to join forces with City Council members and other politicians to demand officials to stop the evictions and launch an investigation into Chan's business dealings, including the $7-million city loan Chan had not paid back and which had been forgiven. The plaza had been built with public money, so advocates argued that the developer had an obligation to the community. The psychological and emotional toll on those faced with eviction is severe, and for seniors, this may even result in serious health complications. (19) Thus, seniors rights organizations advocate strongly for the right of elders to age in place. Over the course of the lawsuit, some elderly tenants fell ill immediately and died in the first few months. Other tenants’ health deteriorated rapidly. Several were forced to enter nursing homes. One tenant’s diabetes became severe; he lost his eyesight and use of his legs. In addition to the activist perspective on political education and movement, the Pacific Renaissance tenants brought a strong cultural component to the campaign. In “From Moving feels like Home”to “We will not be moved!,” Diana Pei Wu, a member of CJWP provides an analysis of the dynamics and lessons of this campaign: “While professional activists and advocates focused on the legal aspects of the campaign, youth and young adult activists also felt that cultural work was an important aspect of mobilization. These young people added to the campaign’s cultural productions that emphasized healing collective injuries and celebrating community and identity in order to motivate collective action.” CJWP members wrote and performed street theater and poetry, painted tenants’ stories and Chinatown’s struggles on canvas and glass, created a video-poem that was widely shown, and provided documentation of years of action through photographs, audio recordings, and writing. Lawyers for the tenants in the community groups looked at wrongdoing by both the developer and the city. Margaretta Lin, one of the main attorneys involved with the case, mentioned that the legal team made an exhaustive research on the matter in order to make a strong case against Chan. They “reviewed the lease, papers and all the documents that we had,” said Lin. (27) After the legal team reviewed the agreements and the facts, the tenant advocates discovered that the tenants had been overcharged $2 million on their rents and that the city had been tricked into forgiving a total of $16 million in debt. The second phase of the campaign, which began in at the end of 2003, was characterized by a lack of clarity within the coalition about strategy. Wu describes a “lack of trust and understanding among coalition members and organizations, and the slowness of the legal process combined to produce a situation in which the coalition lost the capacity to continue the highly public nature of the campaign.” Some organizations had left the coalition and those who remained were divided amongst the possible routes to continue with the campaign. CJWP argued that pursuing one lawsuit against the city was not going to be sufficient to maintain the momentum of the community campaign. Coalition members continued to support the family members of the elderly tenants who emerged as leaders from the campaign, and they continued to support the legal cases by planning occasional public events. However, the momentum of the campaign had slowed. Art describes what followed was a “stalemate [that] continued for a long while.”(30) Not without conflict, the coalition decided to focus most its efforts in following the legal path to obtain its goals. Coalition members still hoped to preserve affordable housing units in Oakland Chinatown, but some members wondered whether they should continue fighting specifically for the units at Pacific Renaissance Plaza. After nearly five years of legal and political maneuvers, seeing that he could lose the lawsuit, Chan and his attorneys agreed to a settlement. 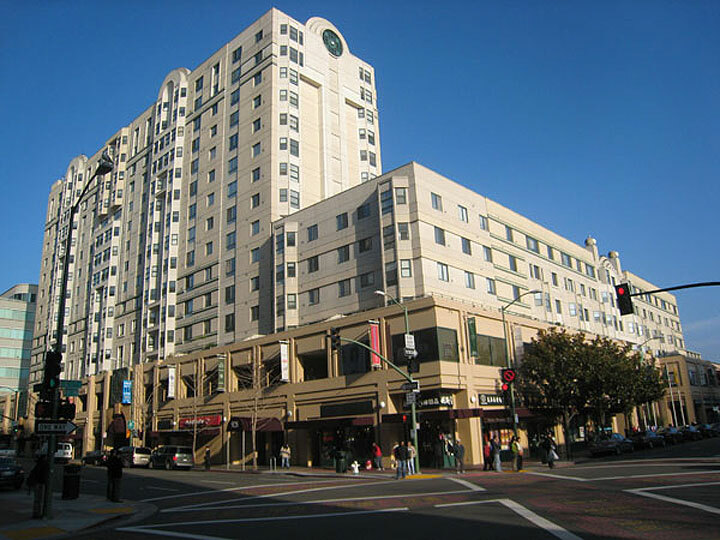 In the final settlement, the affordable housing units at Pacific Renaissance Plaza were sold to a local non-profit housing developer, the East Bay Asian Local Development Corporation (EBALDC) at a set price. The settlement stated that, “The 50 existing units will be sold as affordable moderate-income condos, with a lifetime lease for the one remaining tenant.” These sales, after paying off the purchase loan and the city's legal bills, would raise enough money to develop approximately the same number of permanently affordable rental units nearby in Chinatown. (32) It also established that EBALDC would sell the units at an affordable market price to homeowners. The city approved the settlement in September 2007. The sale to the non-profit housing developer closed at the end of 2007. 8. Michael Rawson, Director of The Public Interest Law project and legal advisor in the campaign. Interview by author, April 17, 2015. 10. Chang, CJWP Historical Documentation Project. 11. Chen, Adelaide. "Oakland Tenants Win Settlement." Asian Week: The Voice of Asian America. N.p., September 28, 2007. Web. April 7, 2015. 12. Sage, Melody. "A Mother Finds Her Voice in a Fight to save Her Home." KALW, February 22, 2012. Web. April 9, 2015. 13. Adam Gold, from Causa Justa/Just Cause, member of the coalition. Interview by author, April 1, 2015. 14. Chang. CJWP Historical Documentation Project. 15. Margaretta Lin, EBCLC attorney, legal advisor of the coalition. Interview by author April 14, 2015. 17. Wu, Diana Pei. From "Moving Feels Like Home" to "We Will Not Be Moved!"Diss. Comp. Institute for the Study of Social Change. UC, Berkeley, Department of Environmental Science, Policy and Management, 2006. Berkeley: ISSC Fellows Working Papers: ISSC WORKING PAPER SERIES, 2006. 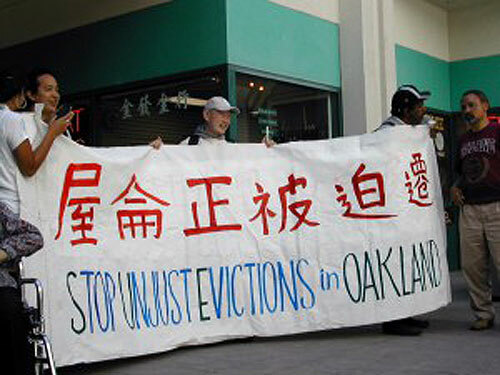 From "Moving Feels Like Home” To “We Will Not Be Moved!”: Immigrant Communities Facing Evictions and the Role of Young People’s Organizing, Oakland Chinatown, CA, 2003-2005. [http://www.academia.edu/395109/From_Moving_Feels_Like_Home_to_We_Will_Not_Be_Mov ed_ Academia], March 28, 2006. Web. April 7, 2015. 18. Rayburn, Kelly. "Deal Is Reached in Chinatown Eviction Lawsuit." Inside Bay Area. N.p., September 20, 2007. Web. April 9, 2015. 20. Rawson. Interview by author, April 17, 2015. 21. Chang. CJWP Historical Documentation Project (Accessed April 23, 2015). 22. Sage, KALW, February 22, 2012. Web. April 9, 2015. 24. Wu, [http://www.academia.edu/395109/From_Moving_Feels_Like_Home_to_We_Will_Not_Be_Mov ed_ Academia]. 26. Chang. CJWP Historical Documentation Project (Accessed April 23, 2015). 27. Lin, Interview by author April 14, 2015. 28. Chen, Asian Week: The Voice of Asian America. 29. Wu, [http://www.academia.edu/395109/From_Moving_Feels_Like_Home_to_We_Will_Not_Be_Mov ed_ Academia], March 28, 2006. Web. April 7, 2015. 30. Art Hom. Interview by author April 17, 2015. 31. Wu, [http://www.academia.edu/395109/From_Moving_Feels_Like_Home_to_We_Will_Not_Be_Mov ed_ Academia]. 32. Ener Chiu from EBALDC. Interview by author May 11, 2015.